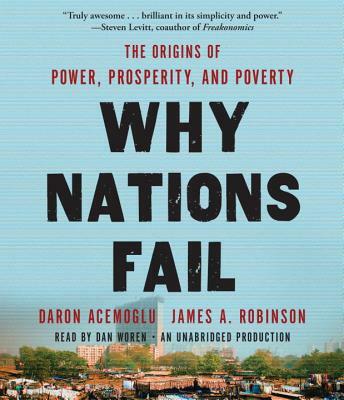 Daron Acemoglu and James Robinson conclusively show that it is man-made political and economic institutions that underlie economic success (or lack of it). Korea, to take just one of their fascinating examples, is a remarkably homogeneous nation, yet the people of North Korea are among the poorest on earth while their brothers and sisters in South Korea are among the richest. The south forged a society that created incentives, rewarded innovation, and allowed everyone to participate in economic opportunities. The economic success thus spurred was sustained because the government became accountable and responsive to citizens and the great mass of people. Sadly, the people of the north have endured decades of famine, political repression, and very different economic institutions—with no end in sight. The differences between the Koreas is due to the politics that created these completely different institutional trajectories. - China has built an authoritarian growth machine. Will it continue to grow at such high speed and overwhelm the West? - Are America’s best days behind it? Are we moving from a virtuous circle in which efforts by elites to aggrandize power are resisted to a vicious one that enriches and empowers a small minority? philanthropy from the wealthy nations of the West? Or learning the hard-won lessons of Acemoglu and Robinson’s breakthrough ideas on the interplay between inclusive political and economic institutions? DARON ACEMOGLU is the Killian Professor of Economics at MIT. In 2005 he received the John Bates Clark Medal awarded to economists under forty judged to have made the most significant contribution to economic thought and knowledge. JAMES A. ROBINSON, a political scientist and an economist, is the David Florence Professor of Government at Harvard University. A world-renowned expert on Latin America and Africa, he has worked in Botswana, Mauritius, Sierra Leone, and South Africa. "Ranging from imperial Rome to modern Botswana, this book will change the way people think about the wealth and poverty of nations...as ambitious as Jared Diamond's Guns, Germs, and Steel."